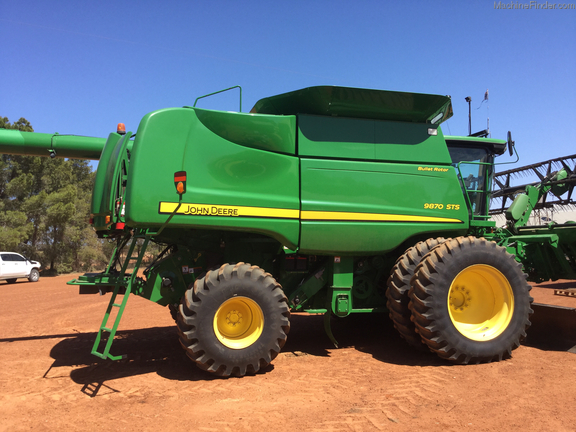 John Deere S680 small grain harvester with John Deere 640D 40ft draper, Goodyear 520/85R42 duals and 600R28 rears, 12″ axle extensions, ProDrive transmission with HarvestSmart, GME UHF radio, John Deere 2630 armrest display, AutoTracTM ready, HID lighting package. 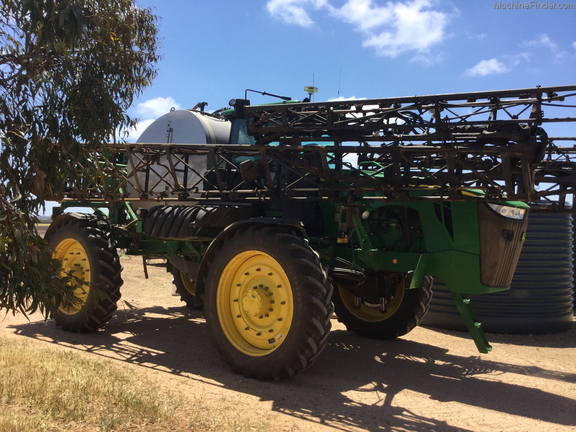 PowerCast tailboard, sidehill kit, power folding grain tank lids, 7.9m unloading auger, 942 separator hours, 1254 engine hours. Extremely good condition, with full service history through our dealership. Call our knowledgeable and friendly staff for more information. Freight can be arranged Australia-wide. John Deere S690 small grain harvester with MidWest Crop Hawk 42 ft draper. 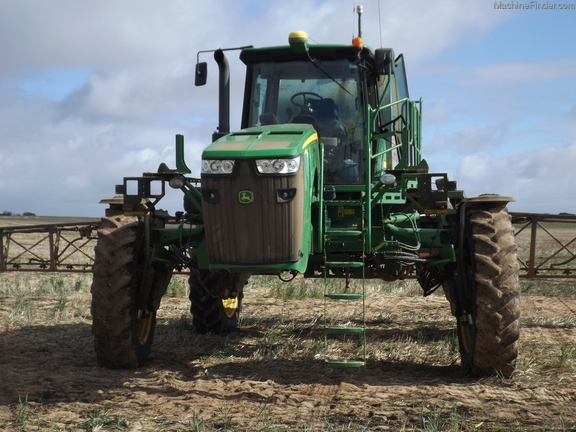 This 2WD harvester is fitted with Goodyear 650/85R-38″ dual drive tyres. 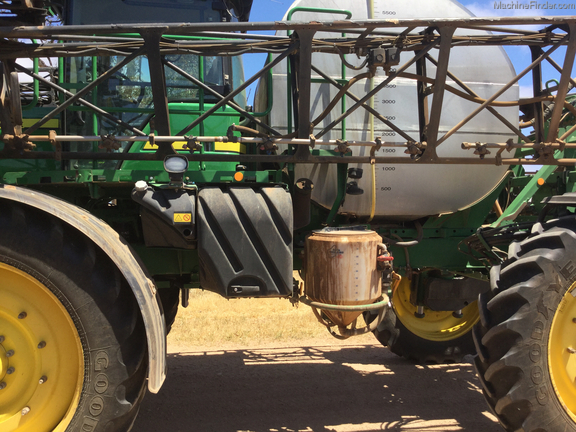 The ProDrive™ transmission system with Harvest Smart system gives you an adaptive, on-the-go control system, designed to enable automatic ground speed control during harvest operation. 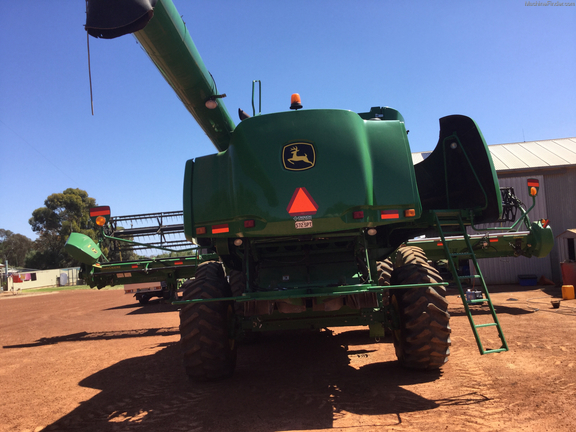 Control your harvesting from the comfort of your well-appointed cab with CommandArmTM controls at your fingertips allowing you to control the folding grain tank covers and 7.9m unloading auger from your seat. The John Deere touch screen 2630 display is conveniently mounted on the armrest giving you easy access to your HarvestMonitor™ data while the Powercast tailboard manages residue efficiently. The 42 foot cutting width of the durable MidWest Crophawk will help give you greater capacity on every pass to optimise your harvesting performance. 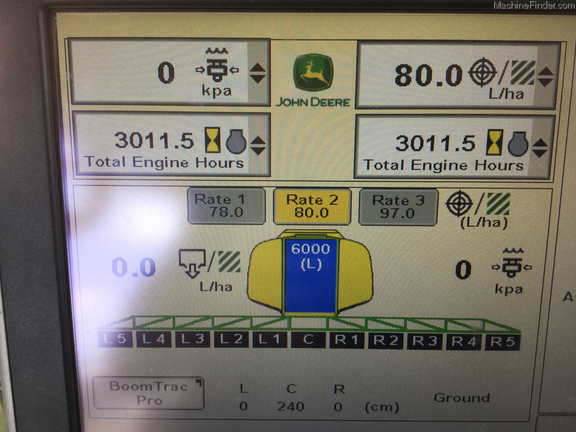 John Deere and MidWest are a great combination that will put you in control of you harvest operation. 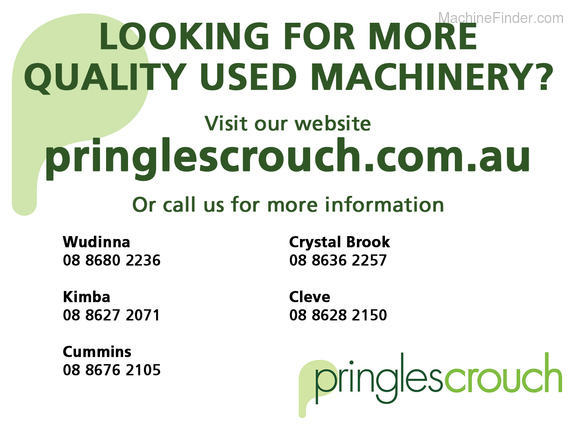 In excellent condition with full service history these units are well worth inspection. For more information talk to our friendly and knowledgeable staff. Freight arranged Australia-wide. 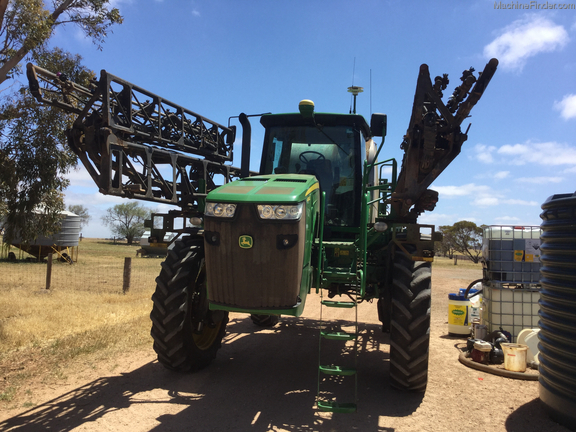 2013 John Deere 4940, 120′ steel boom, 6000 litre tank, 20″ nozzle spacing with left and right fenceline nozzles,, 100L scud tank, mobile weather, hi-flow solution pump, 480/80R50 tyres with fenders, hydraulic tread adjust, traction control, Xenon HID lights. 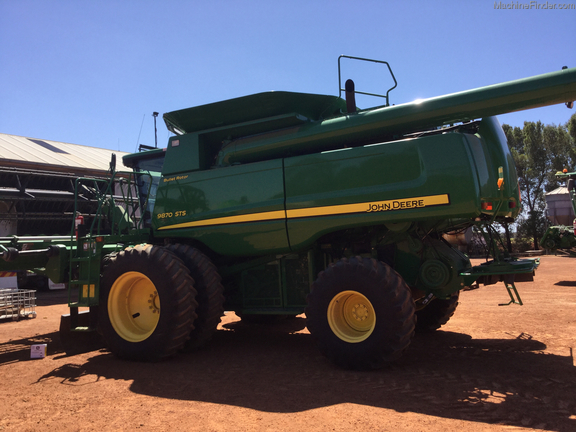 Includes John Deere 2630 display with activations and a John Deere 3000 receiver. Deal with our friendly and professional staff. 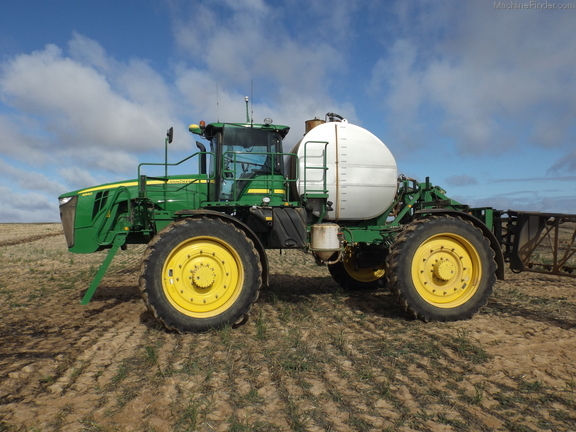 John Deere 9420 tractor, 2002 build, 7773 hrs, 710/70R42 duals @50%, Power shift transmission, 4 SCVs, full weight package, Greenstar ready steering. 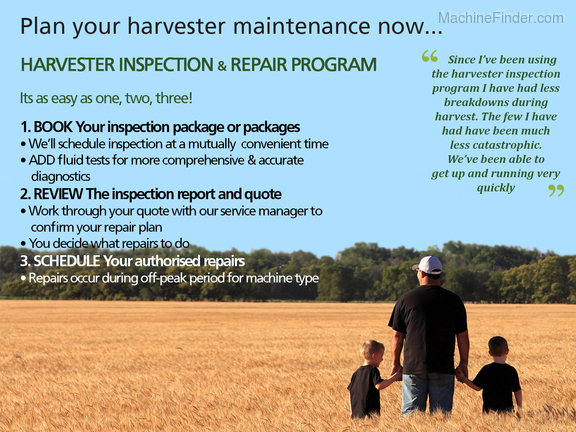 Reliable well maintained machine. Selling on behalf of client. 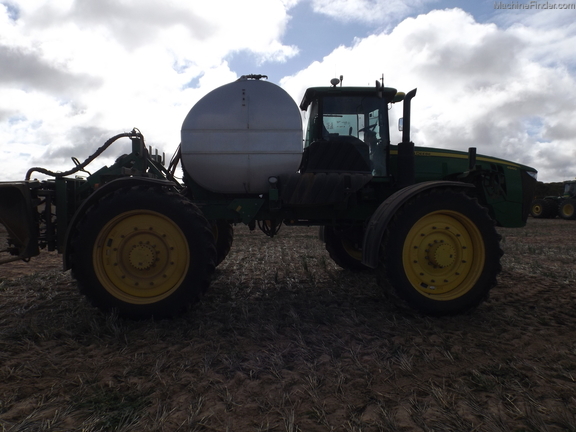 John Deere 640D 40ft draper front, with dual knives and poly tine reel. Manufactured in 2012 this is a very neat unit and well worth inspection. NOTE: comb trailer as shown in photos is not included.